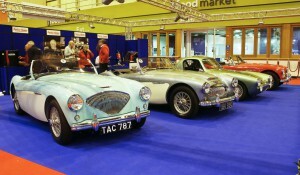 The Club had another successful stand at this year’s Lancaster Insurance Classic Motor Show at the NEC, Birmingham. The display was got together by Midlands member Peter Dodson with help from other members. Friday and Saturday were extremely busy , often with hardly any room to move on the stand. We greeted Club members and other Healey enthusiasts alike and recruited 27 new members. 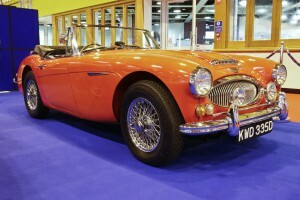 In 1955 Austin added the BN2 model to their Austin Healey range, numerous Improvements included a new 4 speed overdrive gearbox, a stronger Hypoid rear axle and a choice of duo-tone paint schemes. Ever the salesman Donald’s choice of bright Florida Green was guaranteed to get the attention of the World’s motoring press and it was no surprise when It was purchased directly off the stand. Subsequently registered TAC 787 on the 10th November at Warwick Council Offices, the first owner, a Lieutenant Colonel from Woking ran the car for 45,000 miles eventually selling it to Alan Wayland from Sussex in 1963. Two years and 10,000 miles later the car moved back to Woking, then Kent, ending up in Luton and eventually discovered by its current owner in ‘barn-find’ condition, the speedometer showing 91300 miles. Cape International had previously restored the 1953 Turin Motor Show car and used this experience to rescue TAC It was amazing to find details common to both cars including finding the word ‘Show’ written in pencil on the cockpit trims and chrome plated loom dips demonstrating the special treatment lavished on both of these display models. 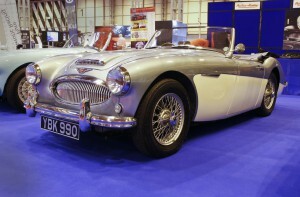 TAC 787 was also the very first Austin Healey painted in Florida Green, however, the colour-matched interior was a ‘show only’ feature with standard production models being trimmed in black. The car was AHC National Concourse winner 2016/17. This is one of just 261 RHD home market cars made. It is a 2912cc 6 cylinder engine with four speed manual gearbox with overdrive. Equipped with Triple SU HS4 carburetors. The car was originally registered in Portsmouth registration YBK 990 painted in British Racing Green. 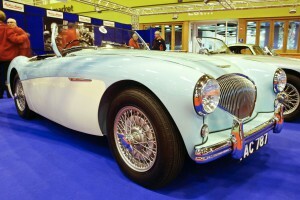 It underwent a total nut and boh restoration by Orchard Restorations some 15 years ago and painted Healey Ice Blue over Ivory with Blue leather and navy blue hood. 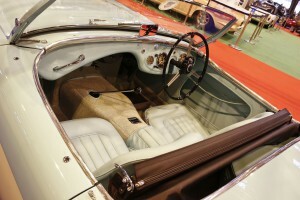 The car has won a number or prizes at classic car shows in the North of England. This car was built at Abingdon on 3rd March 1966. The 2912cc 6 cylinder engine is standard except for fitment of spin on oil filter and supplementary electric fan to aid cooling. Original home market RHD car supplied by RJ.Evans & Kitchen Ltd Birmingham in Ivory White with overdrive, wire wheels, heater, laminated windscreen and leather upholstery. The car was restored in 1990 and painted red. This car is fitted with badge bar carrying additional driving lamps and luggage boot rack which along with the wood rim steering wheel and radio were period accessories. Non standard fitments include the clock and ammeter on the console. The car has an alternator fitted in place or the original dynamo. A pair of rear inner wheel arch shields have been added to prevent accumulation of road debris. Originally built at Abingdon for the RHD home market First destination was to Patrick Motors Limited Birmingham Original colour green. Purchased in 2011 as a restoration project full rebuild commenced in 2012 by Emrys and Pauline Jones in their spare time at home. 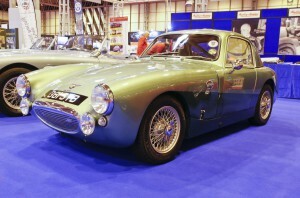 The Sebring Sprite replica kit was supplied by Archers Garage ran by Andrew Fouler in 2012 to reproduce the John Sprinzel’s streamlined bodied Sebring. Colour Aston Martin Sea Green, swage line Spruce Green. Engine 1275cc fully balanced, Eaton supercharger, low compression pistons. Original frogeye seats recovered in green leather and piped in pale green which was the ultimate recycling as the leather was taken from 30 year old Italian leather 3 piece suite! !